Mars and Venus were about 1/4° apart yesterday morning (October 5th) as viewed from Metrowest. 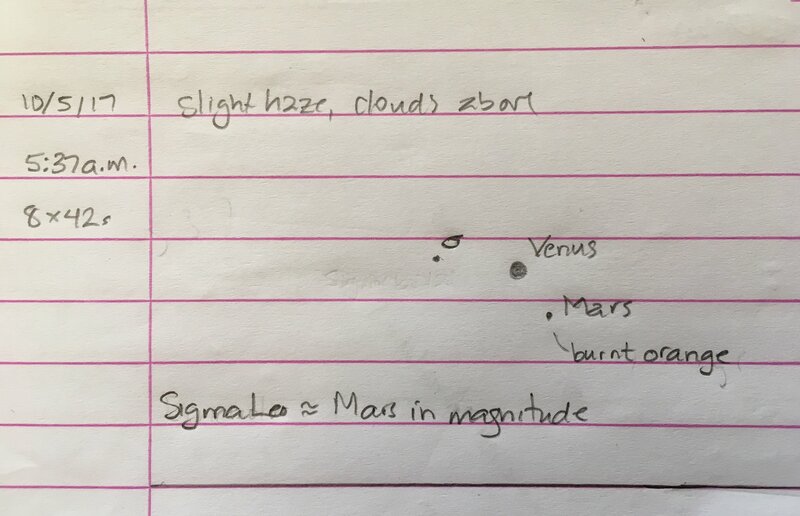 Sigma Leonis was something like 19 arcminutes from Venus. 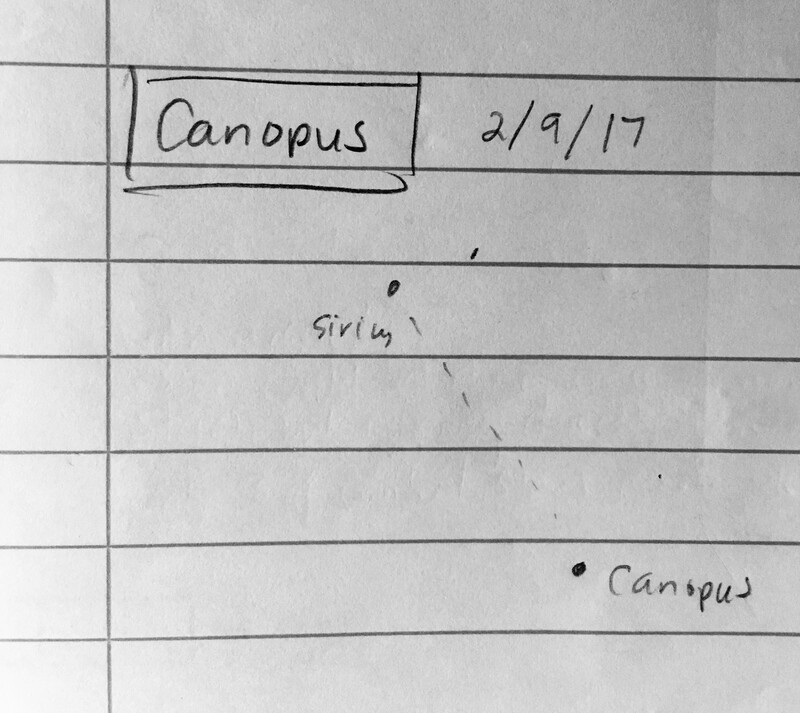 Through binos, the difference between 15 and 19 arcminutes is obvious. Mars and Venus had moved on this morning. Detectably orange Mars stood about 1/2° upper right of Venus (1 o’clock on the dial), with Sigma about 1-1/4° directly above Venus. 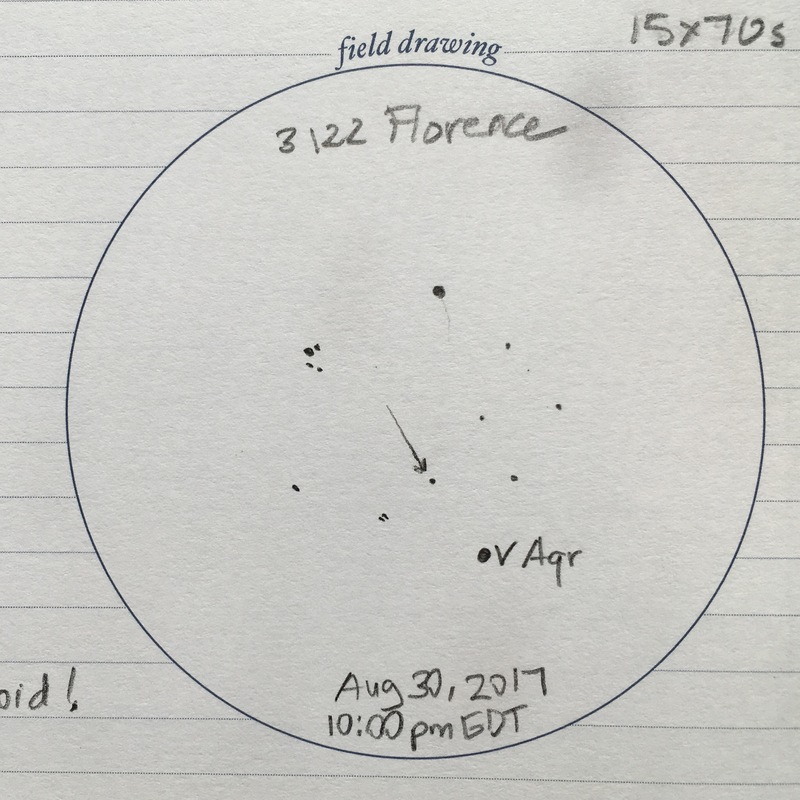 Sometimes I think successful observing is all a matter of confidence. 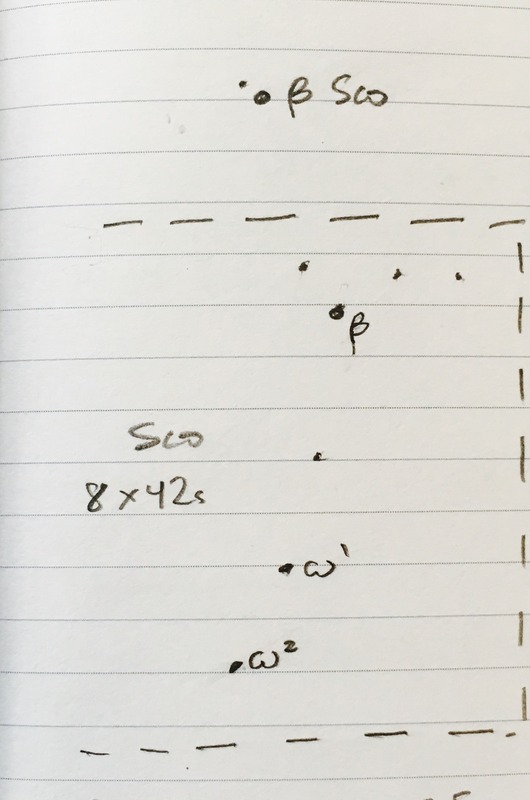 I go through this same sequence every time I look for some moving target: an asteroid, a dim planet, a comet. 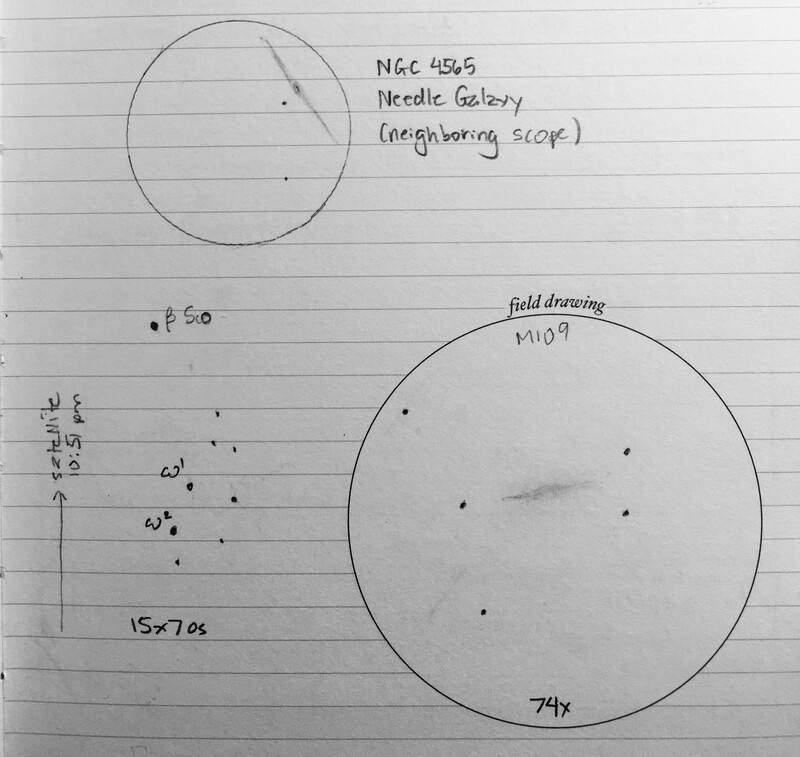 I study the starfield, sketch what I see, but nearly always convince myself I’m looking in the wrong place because the field doesn’t look quite right. 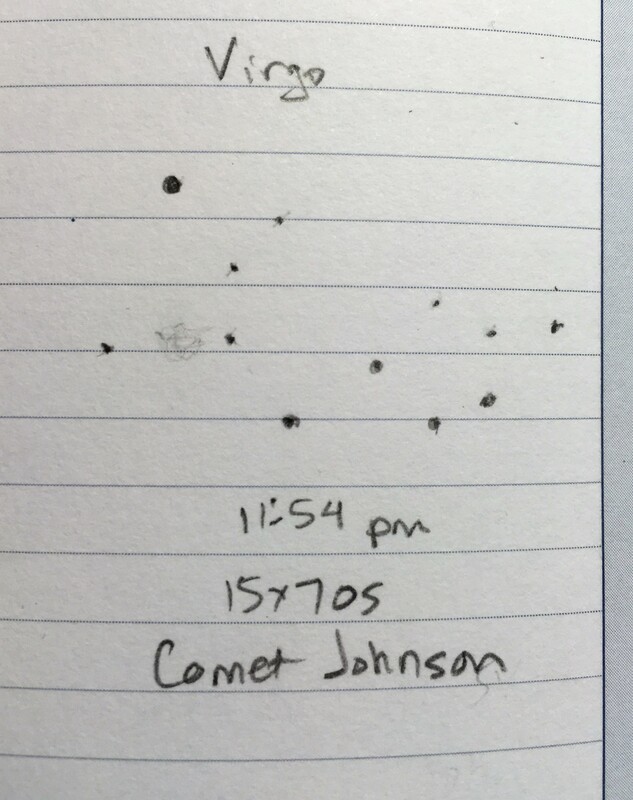 Well, there’s a reason it doesn’t look right, and that reason is either a comet, an asteroid, or a dim planet. 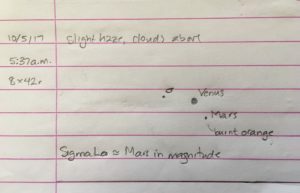 My first view of Uranus or Neptune in the fall? I have to starhop over and over to the field because something seems off. 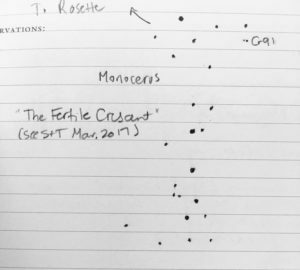 Find a comet? Same thing. 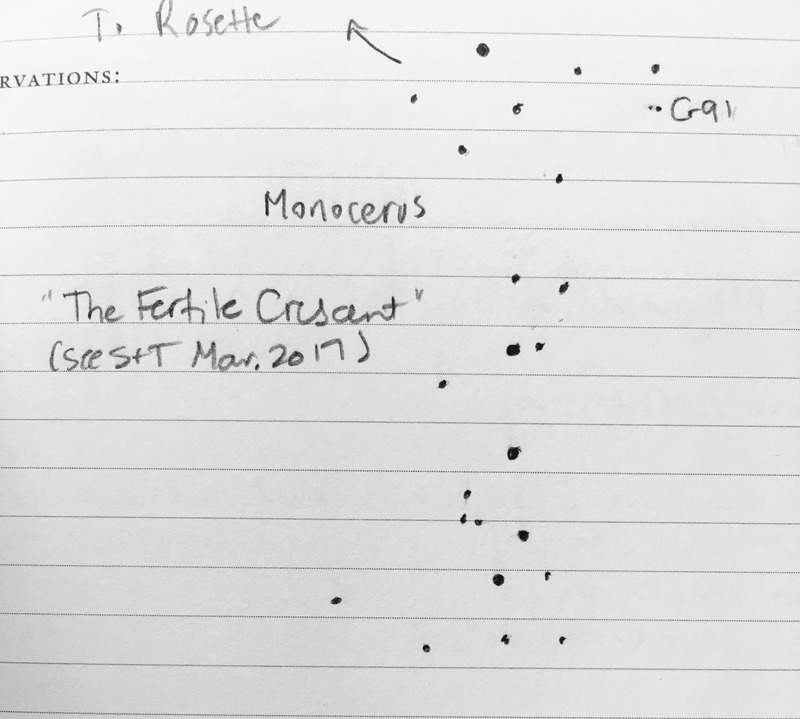 Finding an asteroid? Same deal. It took me forever to believe I was really seeing Florence. Not sure why I don’t just trust my eyes. 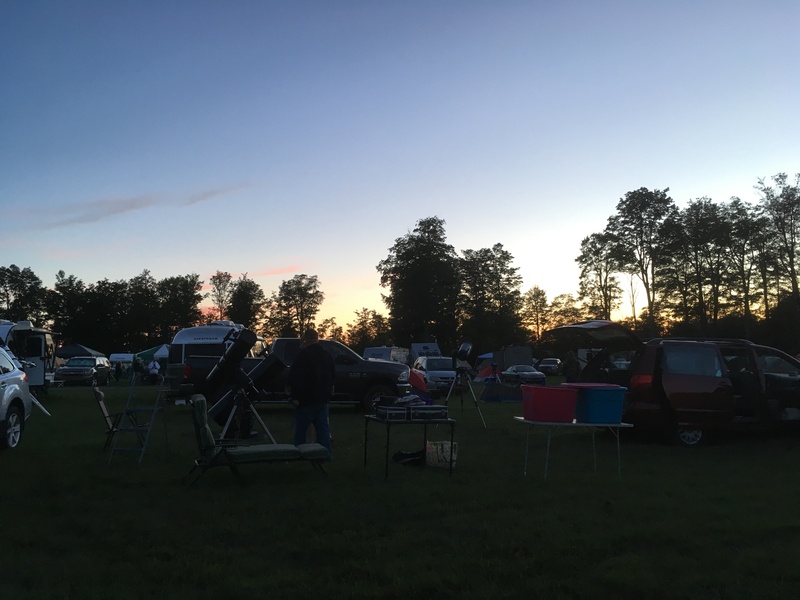 This was our first trip to the Cherry Springs Star Party. I wrote a fairly comprehensive summary for the S&T site awhile back. 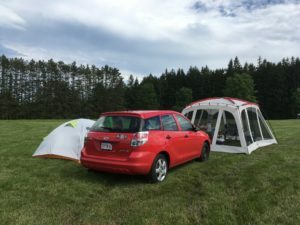 Here are a few random photos from the trip. 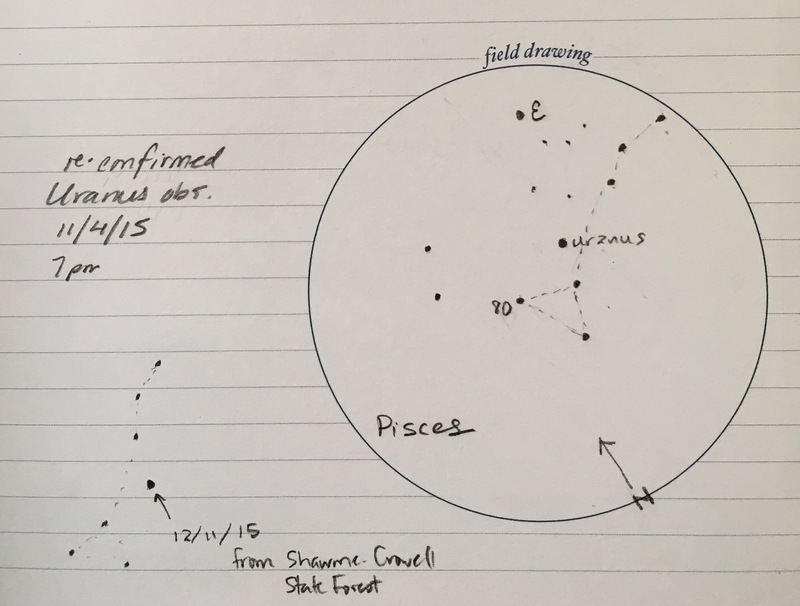 One advantage of being the Observing Editor at S&T is that I can stay late at work at draw my own star charts. 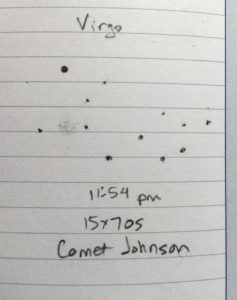 Before going to Cherry Springs, I put one together for Comet Johnson (C/2015), and I have to say, it was admirably accurate. Next year, remind me to park on the other side of the tent. I thought this would give us some privacy from neighbors on the west side, but it turns out they left for a hotel every night anyway. If I’d parked on the other side, I would’ve had better protection from the morning Sun. One good thing about attending a star party within driving distance is that you can pack a lot of stuff in even a small car. 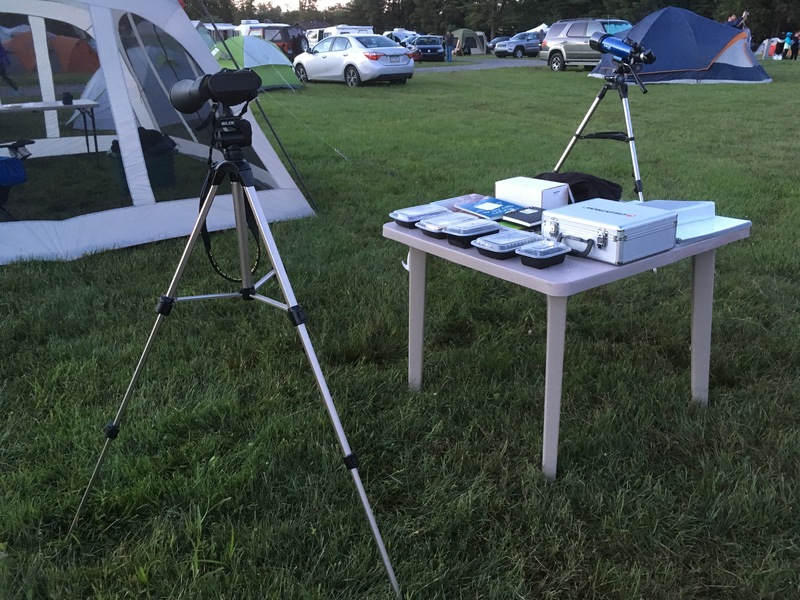 This is the first star party in a long time where I’ve had at least one decent observing table. In an ideal world, Catherine and I would both have our own tables plus a couple of side tables. I prefer print atlases and they take up a lot of room. Plus, we both have 3-ring binders we use as observing notebooks, and then we both have sketch books. There’s pens and pencils, a bin for extra batteries, a bin for setting our lights (so I can always find it again in the dark). I guess another advantage of working at S&T is that I can borrow one of the random scopes sitting around the office when I need to. My 10-inch is way to heavy to drag across state lines, so I bogarted the Lightbridge that lives on the landing of our office staircase for the week. 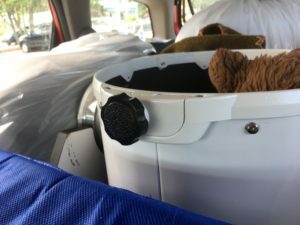 Really easy to transport and set up, I would definitely consider buying one of these if I had $700 burning a hole in my pocket. 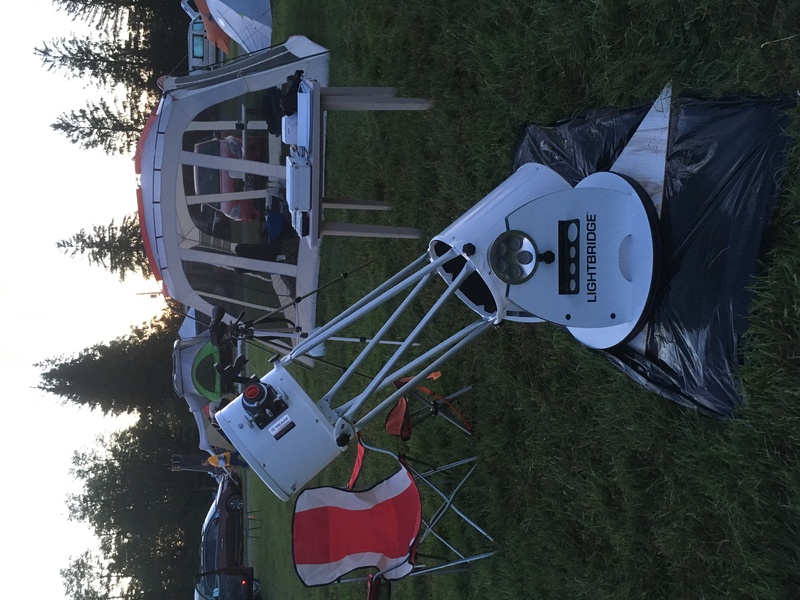 I saw many 12-inch and 16-inch Lightbridges in use this summer. I think the 16-inch would fall into the “too heavy to move around” category for me, but I wouldn’t say no to the 12-inch. As you can see from this photo, the Lightbridge is a good height for me (I’m 5′ 1″ tall). 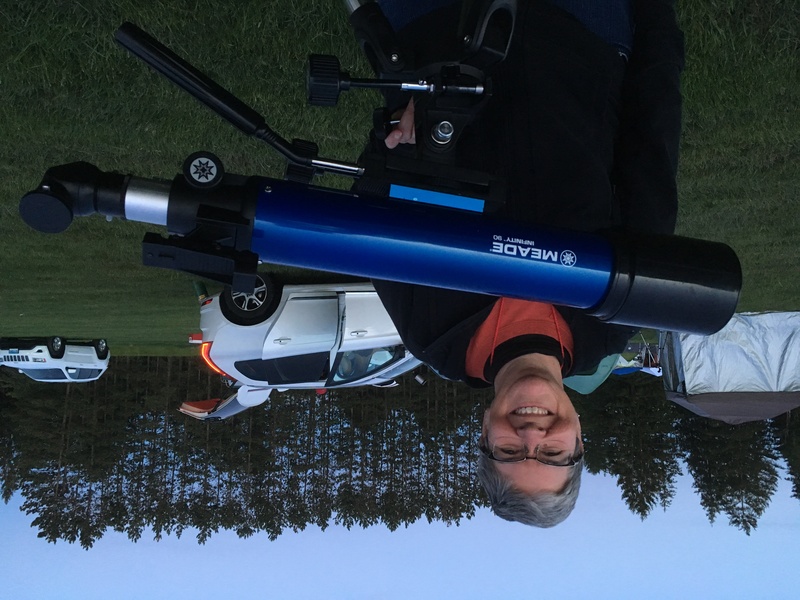 Like all Dobs, it can get a bit awkward when looking at objects close to the horizon (on this night, I was showing off the Andromeda Galaxy to other observers, basically from a crouched position), but when I’m 1/2-way up the sky or more, I find it very comfortable. 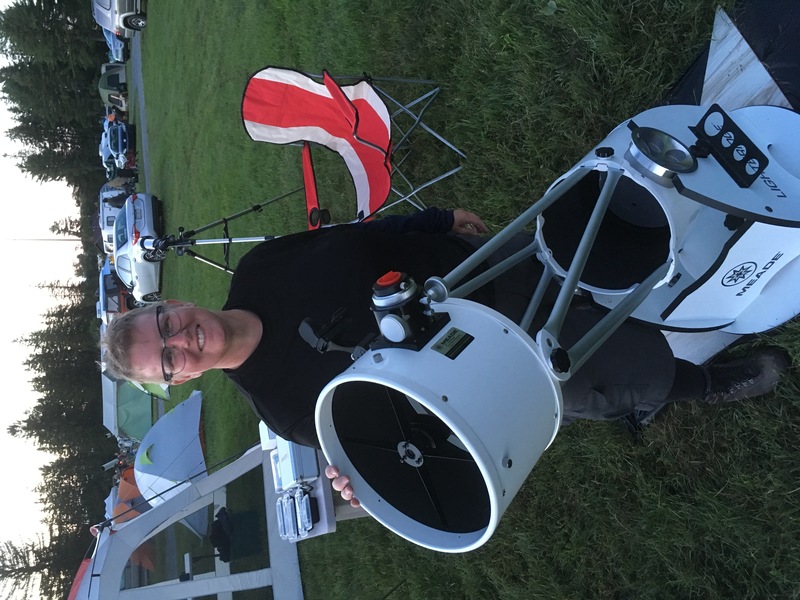 Catherine seems really comfortable with her refractor these days. 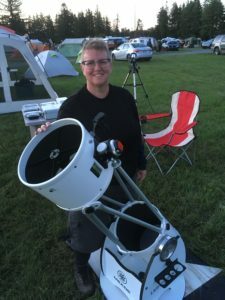 She’s been using it for double stars, plus doing a lot of bino observing. 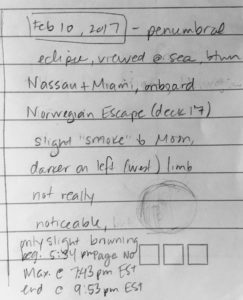 This summer, she used the Irish Federation of Astronomical Society’s Binocular Certificate Handbook to build her observing lists. 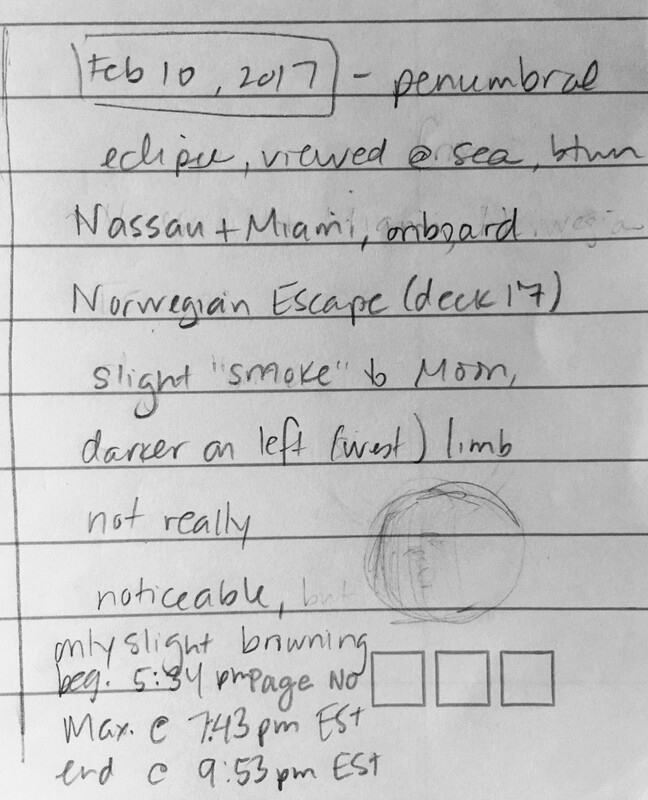 We had one clear night of observing only, so I didn’t make much headway on my observing list. 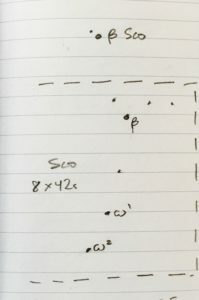 I had planned to do some mapping of the Virgo Cluster, but the light management on Saturday night was really, really bad. Our neighbors to the west opened their trunk at least 5 times, destroying my night vision over and over again. 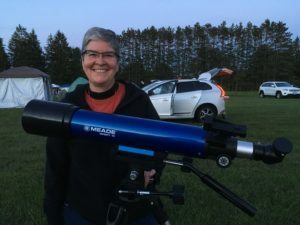 The experience was frustrating enough for me that next time I’ll take a little more time to think about how to isolate my scope from the public — not usually my goal at a star party, but possibly a necessary step to enjoy this one to the fullest. Meade DS-10, purchased c. 1983. 10-inch f/4.5 Newtonian reflector on an equatorial mount. As you can see, I’m still grappling with the beast, only now it lives in Massachusetts, not Indiana. 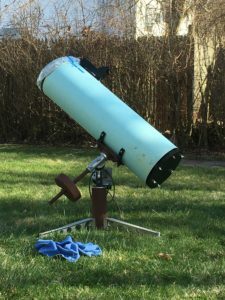 On our last truly warm day before winter, I took a wire brush to the rust on the exposed parts of the equatorial mount. The rust was mostly confined to the balance-weight shaft, but I brushed off some chipping paint on the post as well, then painted all the exposed metal with anti-rust primer. (Except for the tripod feet, they’re already good as they are.) I’ve been waiting for another warm day to cover that primer with black paint, but since one hasn’t arrived, it looks like my mount has a case of the rust. That’s a new Telrad, by the way. I’ve been contemplating building a dob box using Stellafane’s instructions, but I left many of my power tools behind in Indiana and I don’t really have the space to build a box. Or the carpentry skills, really. 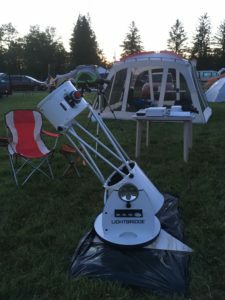 Anyway, I’m also thinking about buying a custom dob mount instead of building one. I’ve got a new motor to install (still), but since I don’t do any imaging, it seems like more trouble than it’s worth. What I am going to get done, though, is stripping the gunk out of the focuser and replacing it with … what … lithium, probably. 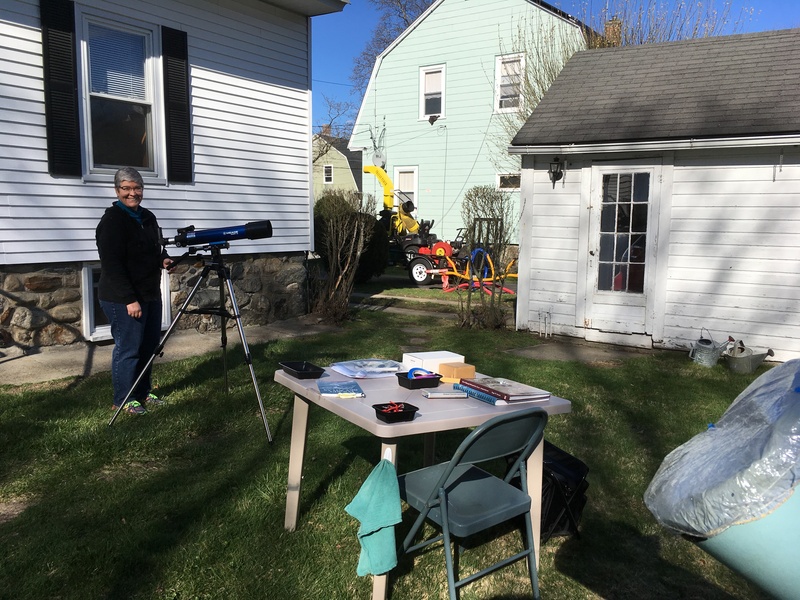 New equipment bins on observing table, Catherine setting up her refractor. 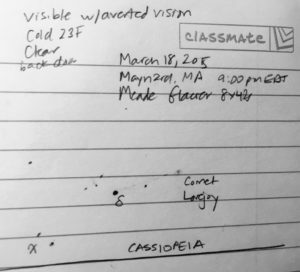 Our last observing session was mostly Saturn, but Catherine also did a lot of double-star sketching with her 90-mm refractor. 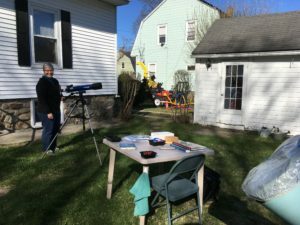 I’ve been trying to figure out a better backyard workspace, but mostly that means subdividing the observing table for task grouping. I’m trying to keep the equipment budget low. Managed to get away from NEAF 2017 having only spent $120, and $20 of that was on a t-shirt. The other $100 was for a Celesteron alt-az tripod. I really needed something heavier (more stable) for the 15×7o binos, as well as for the 90-mm Mak that I like to take camping. I’ve been using the PST on a lightweight photo tripod, so this is a definite upgrade for solar observing. It’s a bit of an overkill for our birding scope, but we took it out to the heron rookery at Sleepy Hollow Cemetery in Concord yesterday, and it was light enough that I didn’t mind carrying it up and down hills. I’m working on this summer’s packing lists. More on that next. 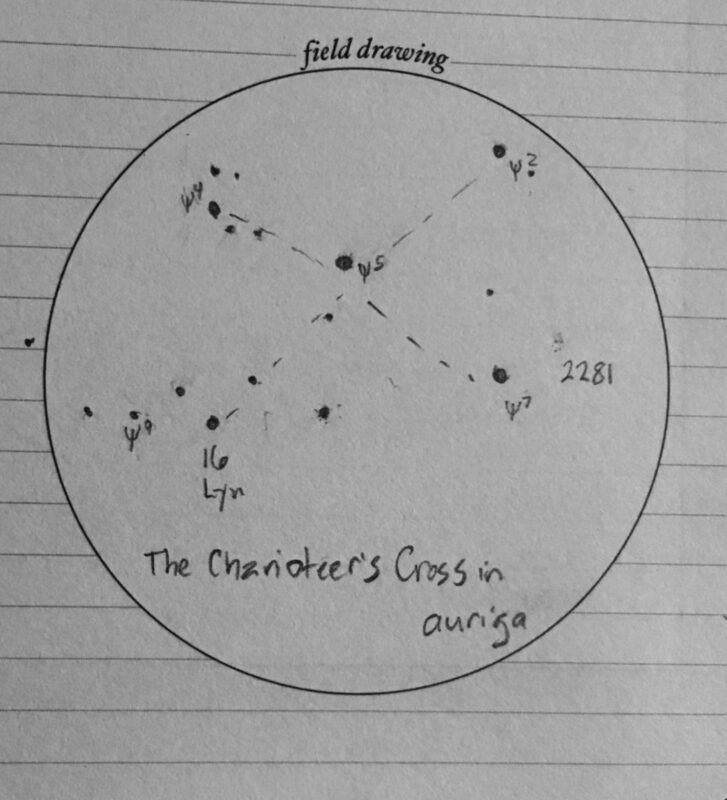 In the November 2016 issue of Sky & Telescope, Matt Wedel wrote about his observations of a crucifom asterism on the Auriga / Lynx border. 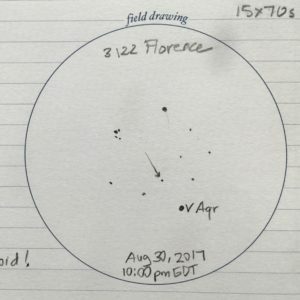 I took a few minutes last week to sketch the field as seen with small binos (8 × 42s). 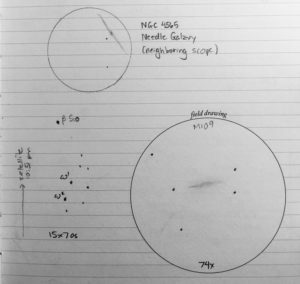 I was unable to resolve any stars in NGC 2281, of course; it was more of a suggestion than anything when viewed with handhelds. 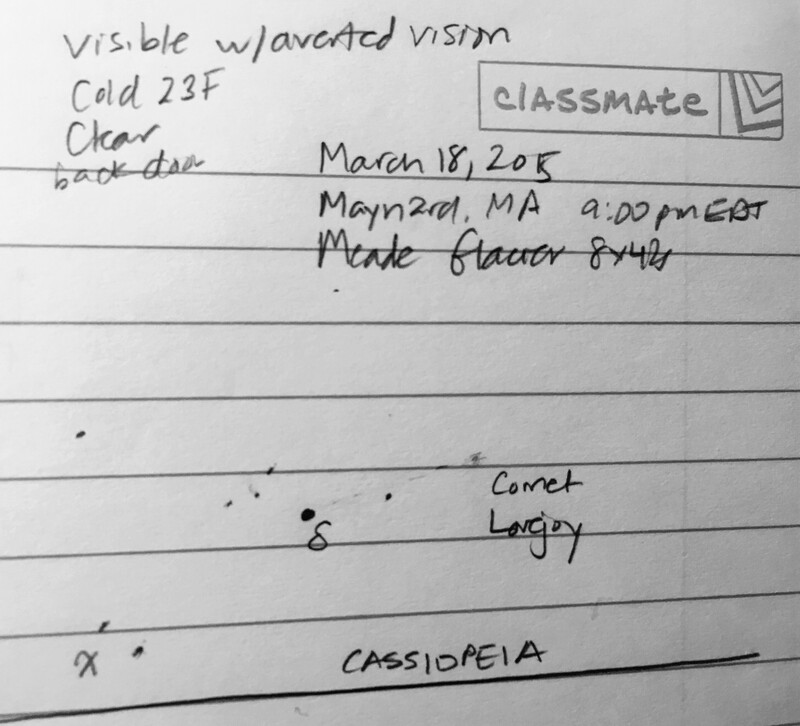 My goal on our next clear night is to return to the view with the 12 × 70s on a tripod. 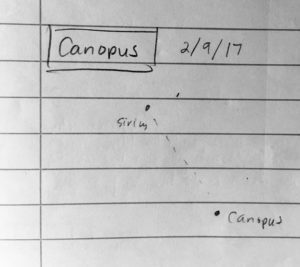 Binocular observations of Uranus. November 3rd was actually my 2nd attempt, as 1st attempt was thwarted by scavenging skunk. Cool but not cold, light haze, Metrowest light pollution. Pisces is dim dim dim.